While colors add visual appeal to clothing and accessories, they add nothing to its intrinsic function: to clothe the body. Colors in food, on the other hand, are more than just skin deep. Brightly colored fruit and vegetables - red peppers, green leafy vegetables, carrots, beets - are an indication that they are packed with nutrients, vitamins and those ever popular antioxidants. Arguably one of the most vibrantly colored vegetables around, beets are an excellent source of fiber, manganese, folic acid, potassium, and the compound betacyanin. Betacyanin, in addition to giving beets its characteristic deep purple color, has been found to exhibit anti-cancer properties. Pairing these nutrient-rich bulbs with antioxidant-rich pomegranate juice is a combination deserving of any fashionable title. 1. Preheat oven to 450 degrees Fahrenheit. 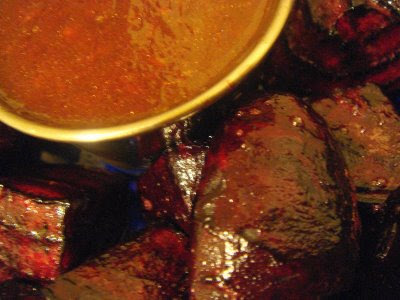 Toss beets with two tablespoons and spread evenly along the bottom of a well greased baking dish. Bake for 20 to 25 minutes until fork tender. 2. Meanwhile, whisk together pomegranate juice, vinegar, honey and grated ginger in a saucepan over medium heat. Cook for about three minutes until juice begins to bubble and thicken slightly. Remove from heat and slowly whisk in the remaining two tablespoons of olive oil. Pour over roasted beets and serve. Oh my friend, this makes my mout water. I love both pomegranate and beet and never tried them this way. And their colors are energizing too. why don't you post the beet drink daddy loves? Ttfn300, beets and goat cheese combination is always a winner! Zerrin, I hope you get to try beets with pomegranate, I think you will like.